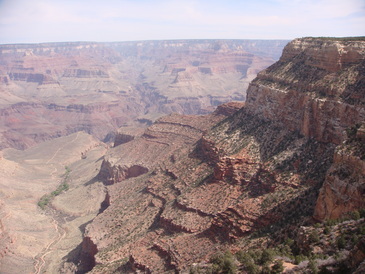 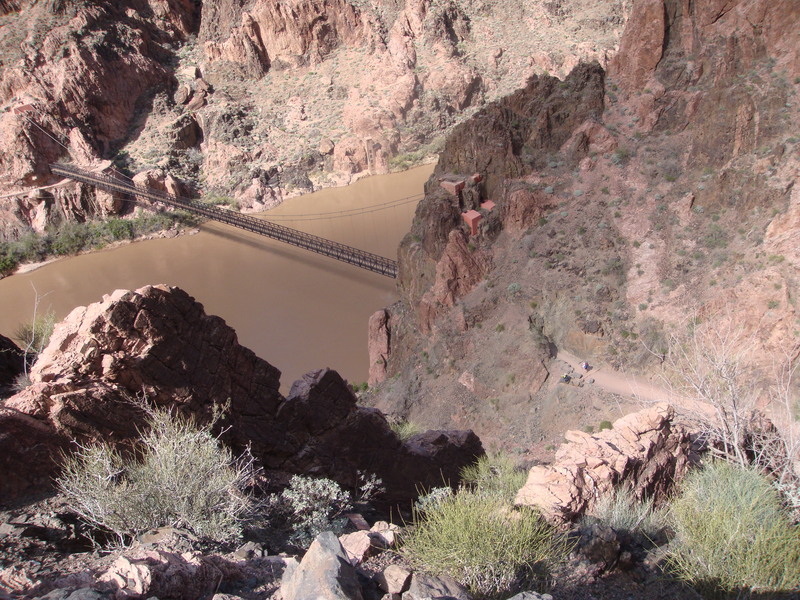 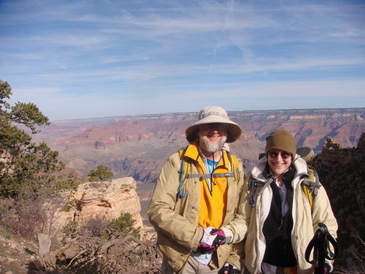 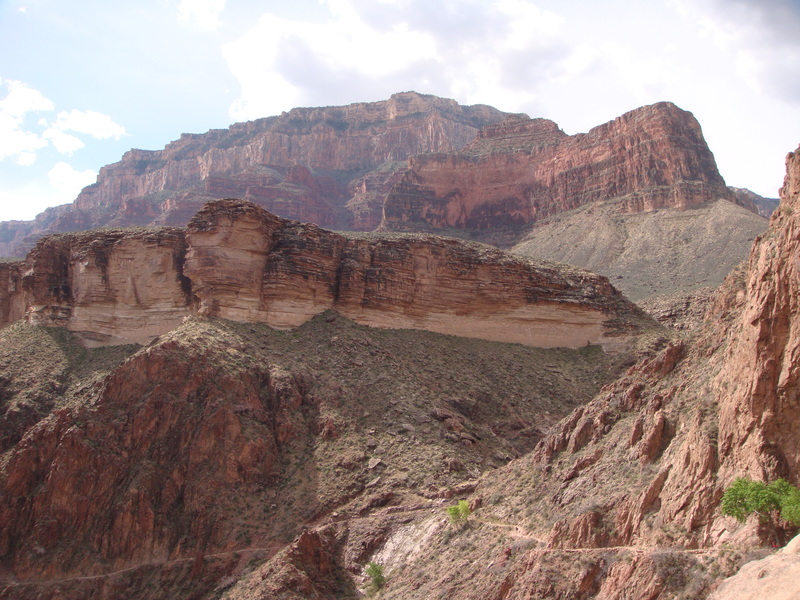 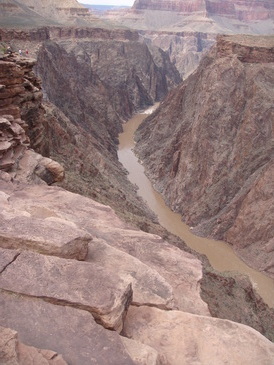 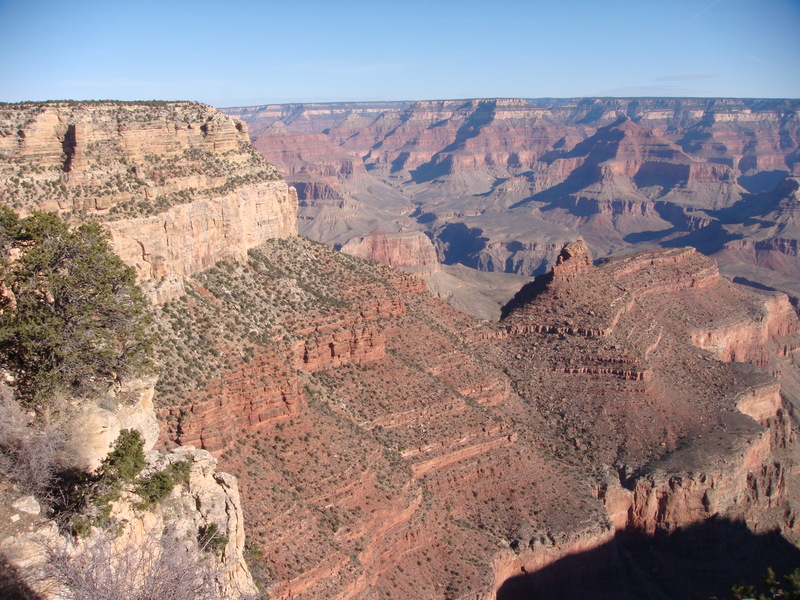 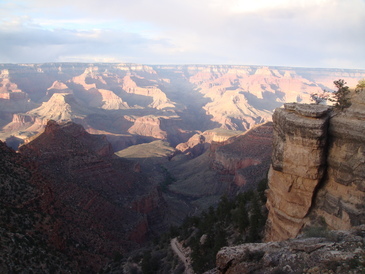 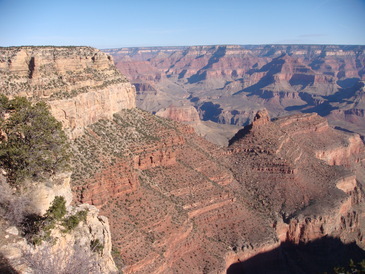 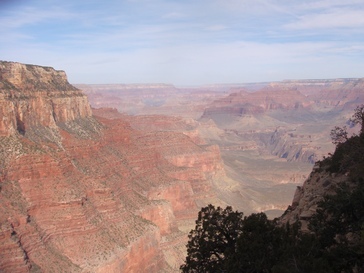 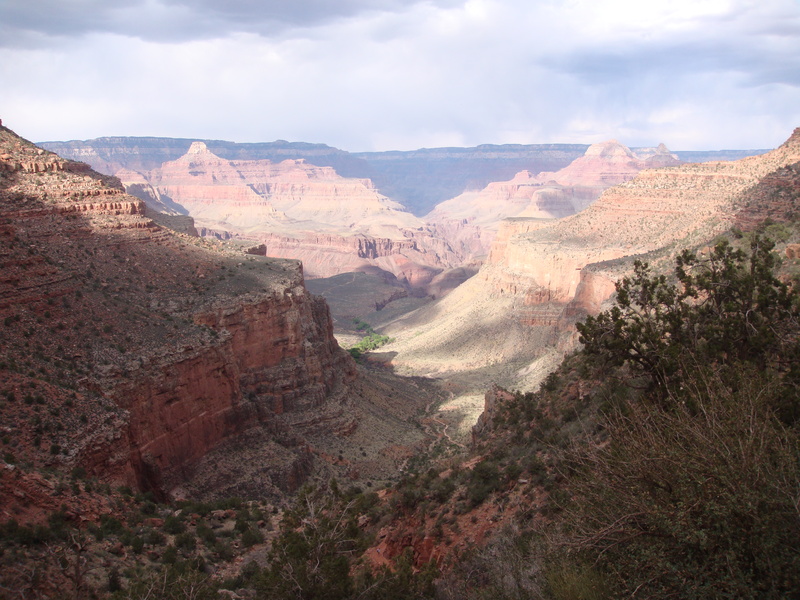 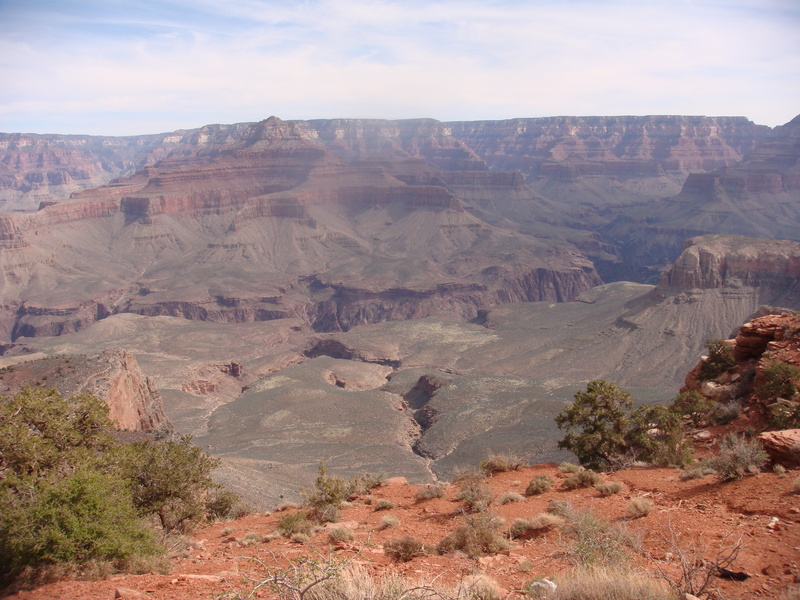 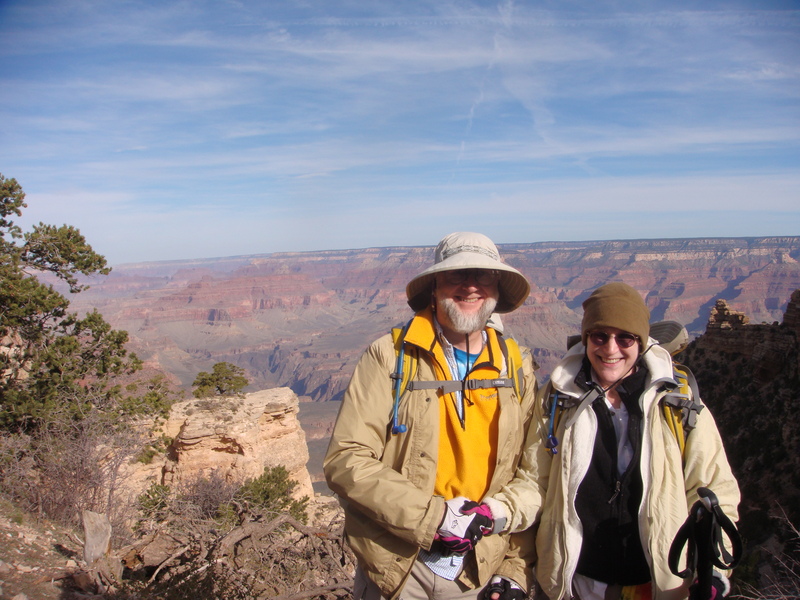 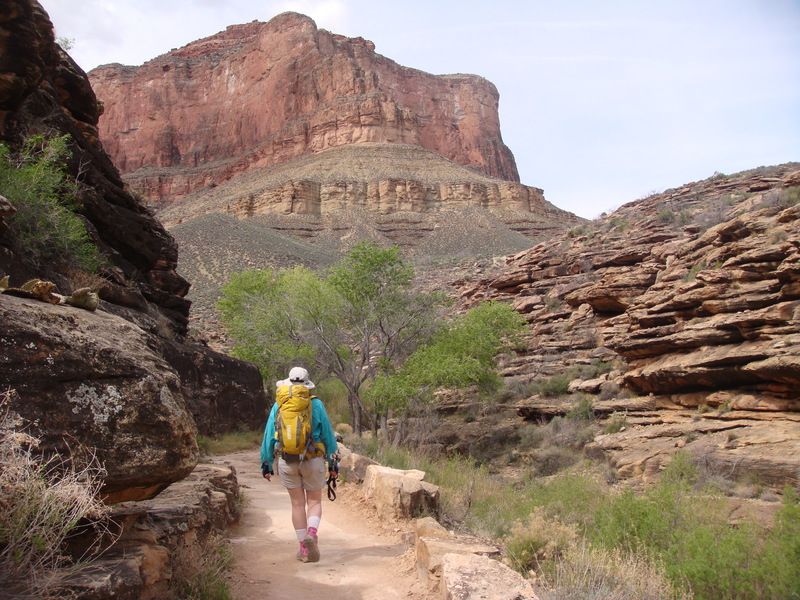 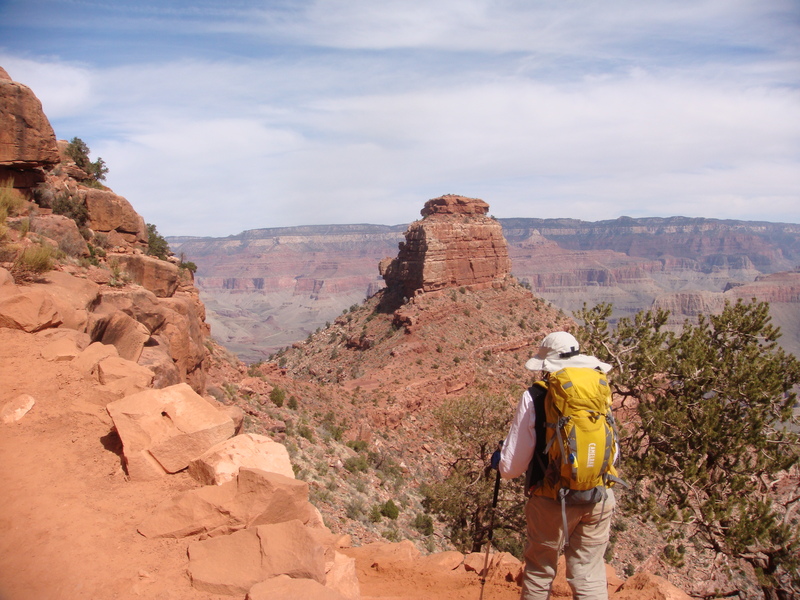 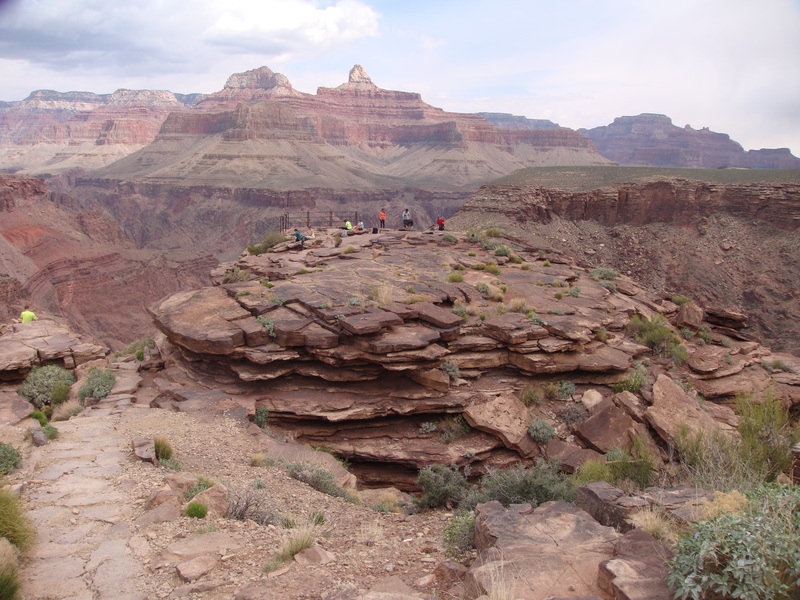 Welcome to the short version of our Grand Canyon travelogue, from March of 2013! 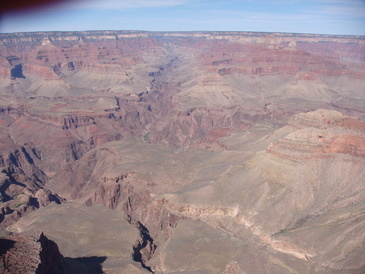 The full set of pictures is here. Click on any picture to see it bigger. 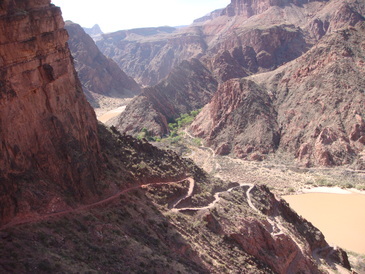 This is our route: South Kaibab (point A to point B) on Thursday, two nights at Phantom Ranch, then Bright Angel (point B to point D) on Saturday, with an excursion to Plateau Point (C). 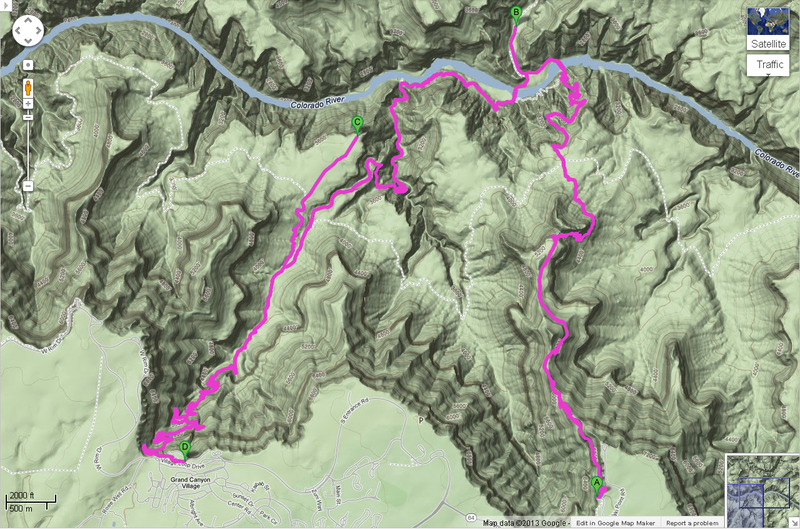 The total hike was 20 miles, with an elevation change of 4500 feet. 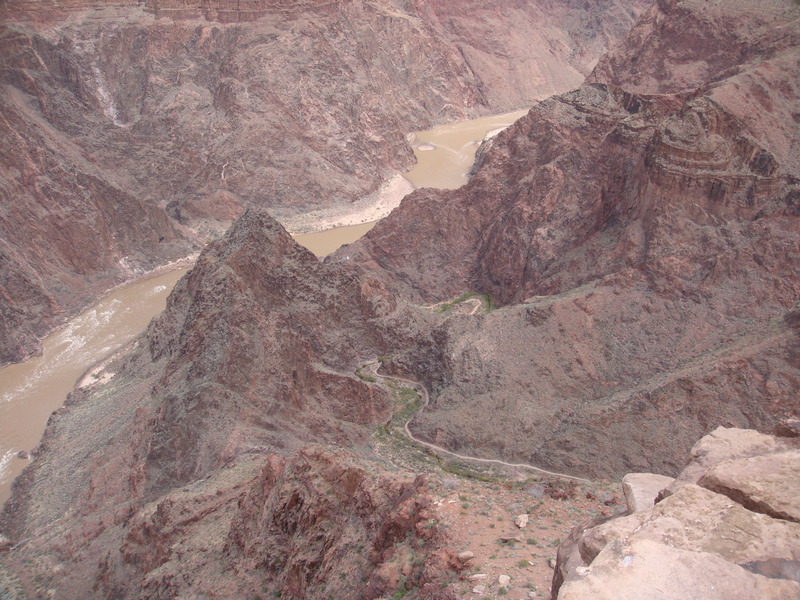 View from Yavapai Point, where you can actually see both Phantom Ranch and the muddy brown Colorado River. 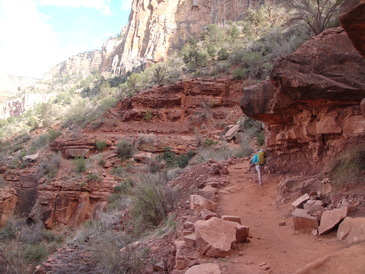 Thursday morning at the South Kaibab trailhead. 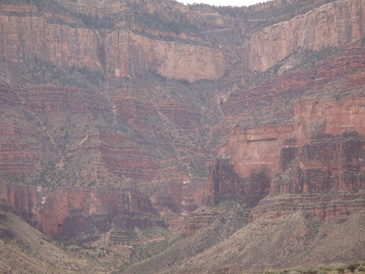 The red cliffs toward the bottom are called "Redwall Limestone". 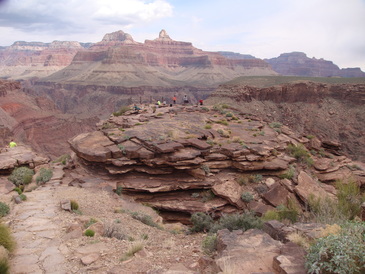 The rock is white, but it's dyed red by the sandstone above it; we saw its true color when we got down to where they'd cut into it for the trail. Down below the first cliff level, looking back the way we came. 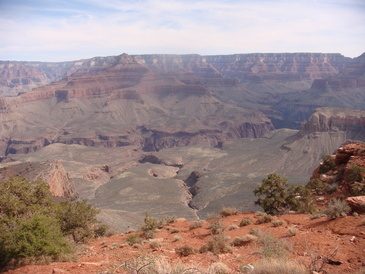 After about a mile, the view opens up at Ooh-Ah Point and Cedar Ridge. 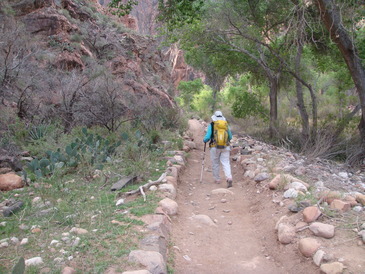 Lia kept getting ahead of me as I stopped to take pictures. 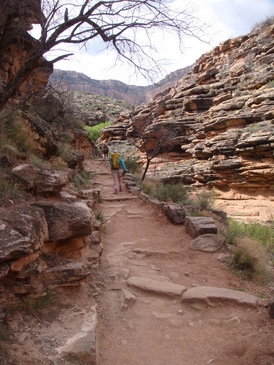 Nearly to the bottom now, we can see Bright Angel Canyon. 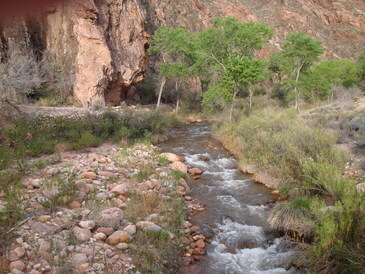 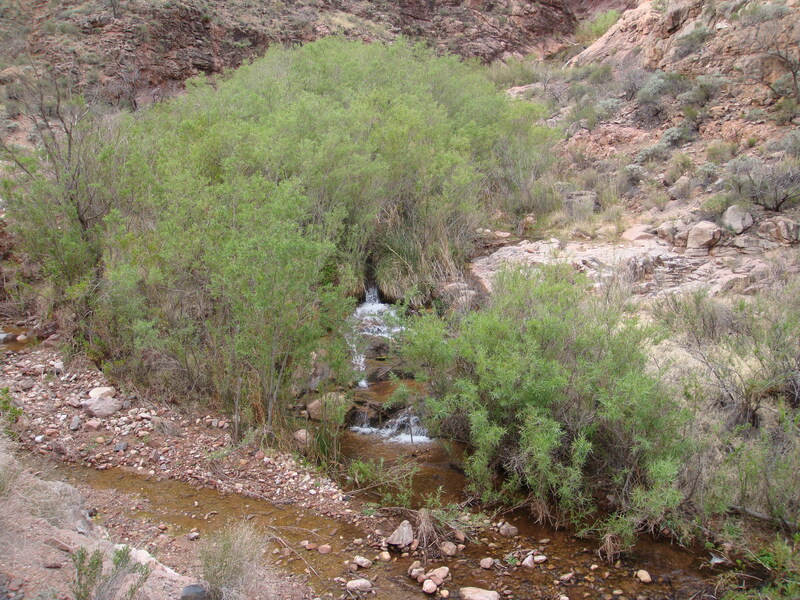 The campground and Phantom Ranch are up this notch, so it has some nice shelter from the sun. 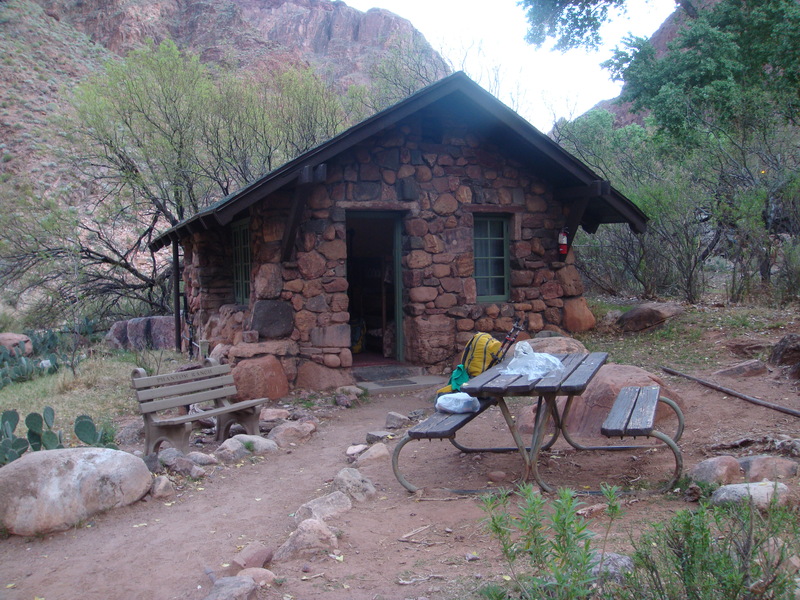 Our cabin, home from home for two nights. Saturday morning we got up at five for the early breakfast, and started with an easy stroll down to the river. 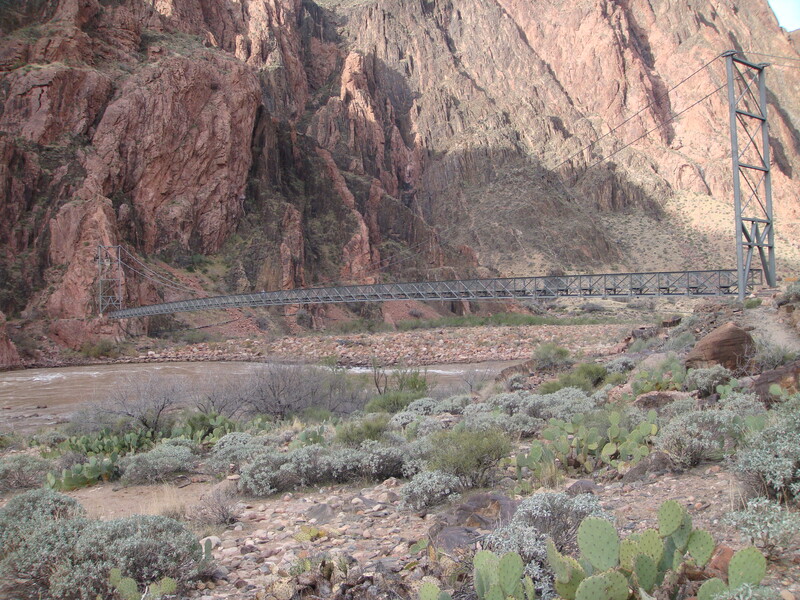 We crossed Silver Bridge and walked parallel to the river for a bit. 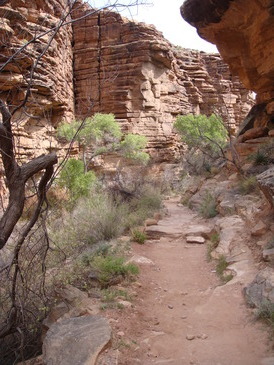 Then we started the ascent up Pipe Creek. 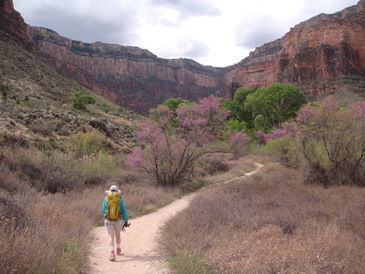 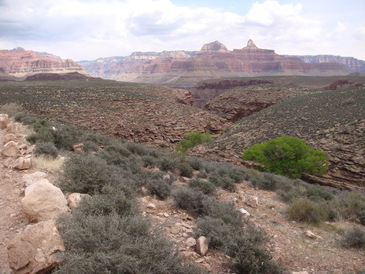 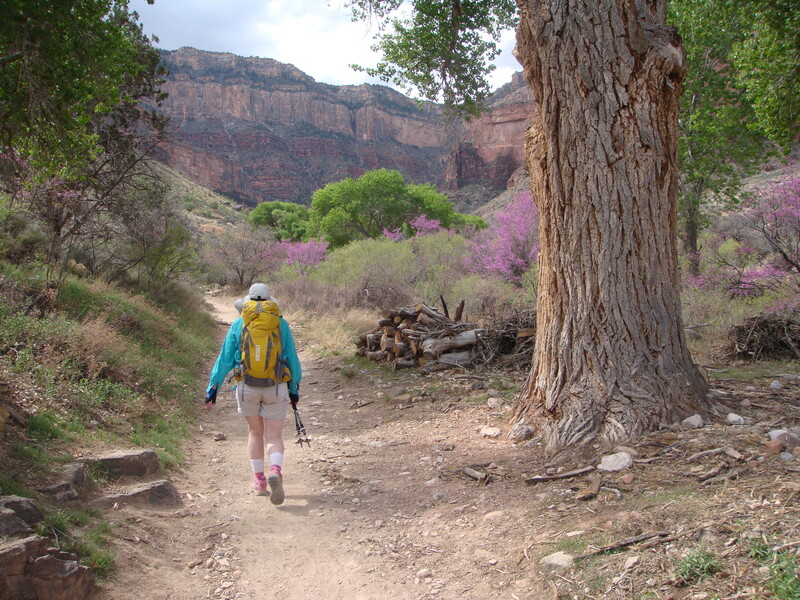 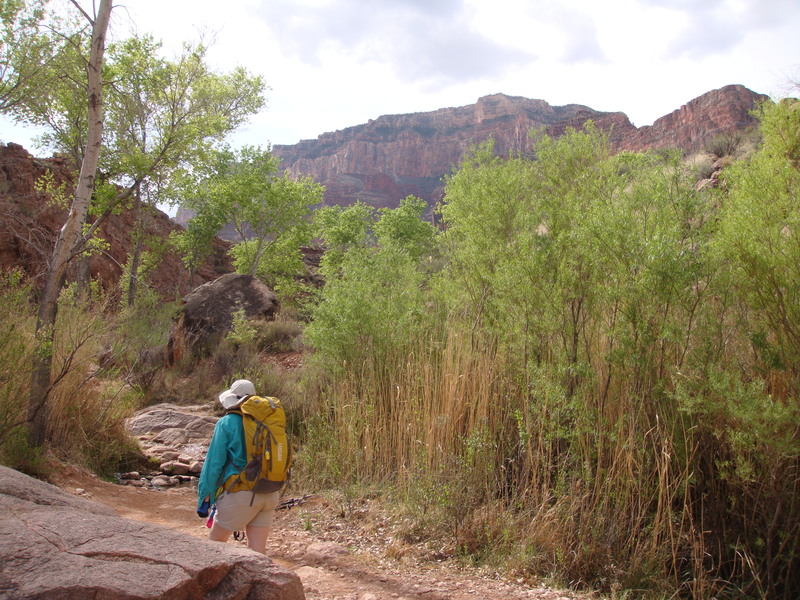 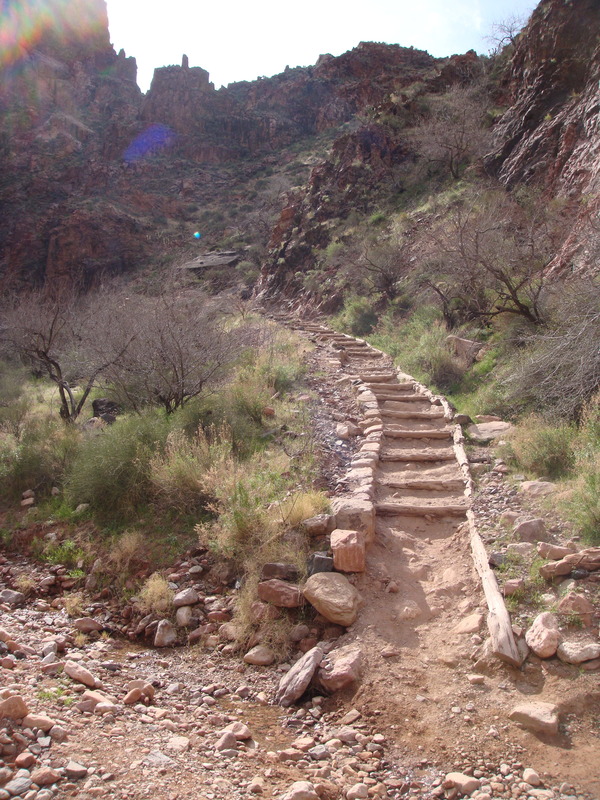 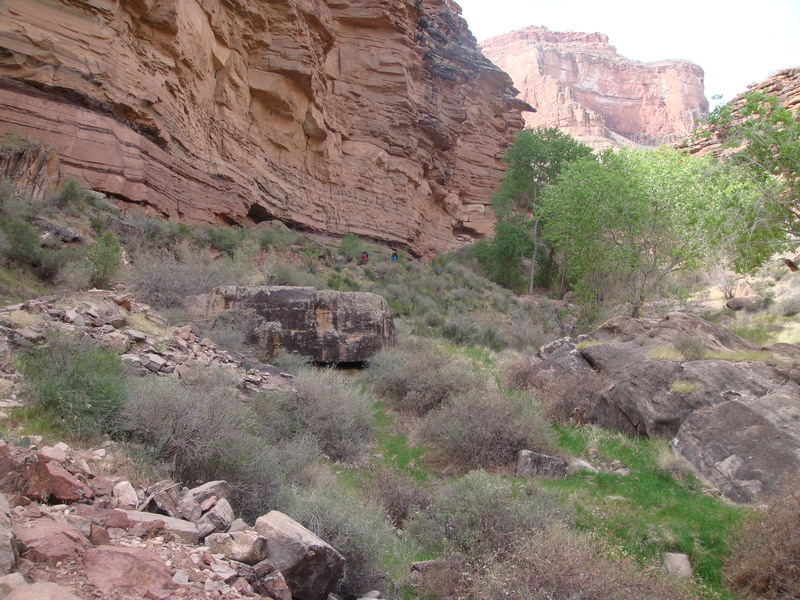 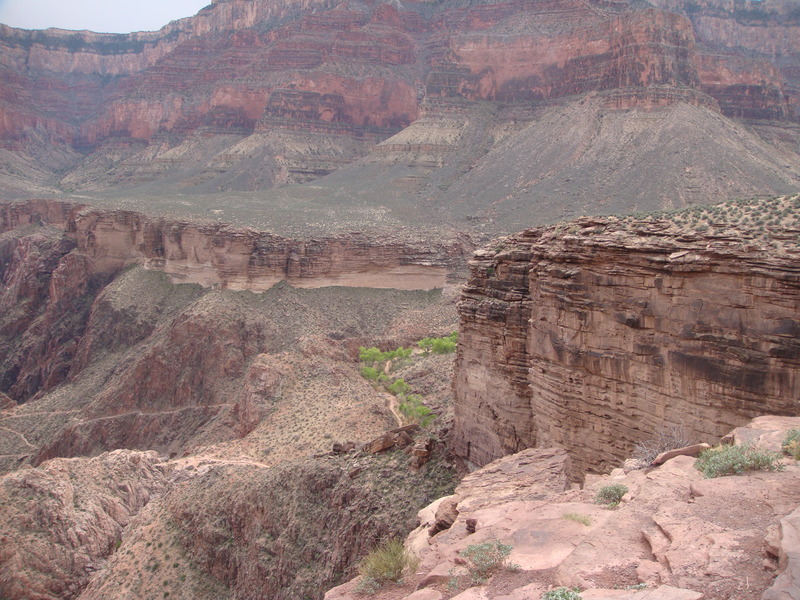 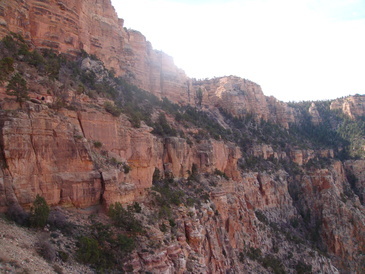 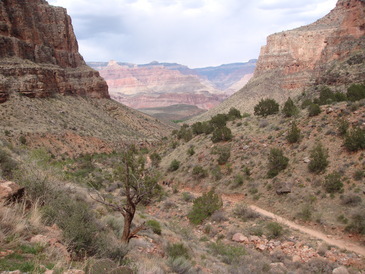 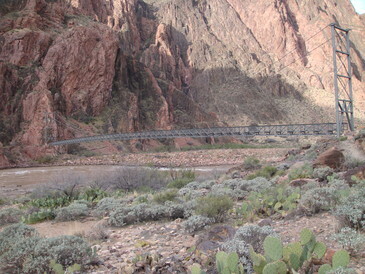 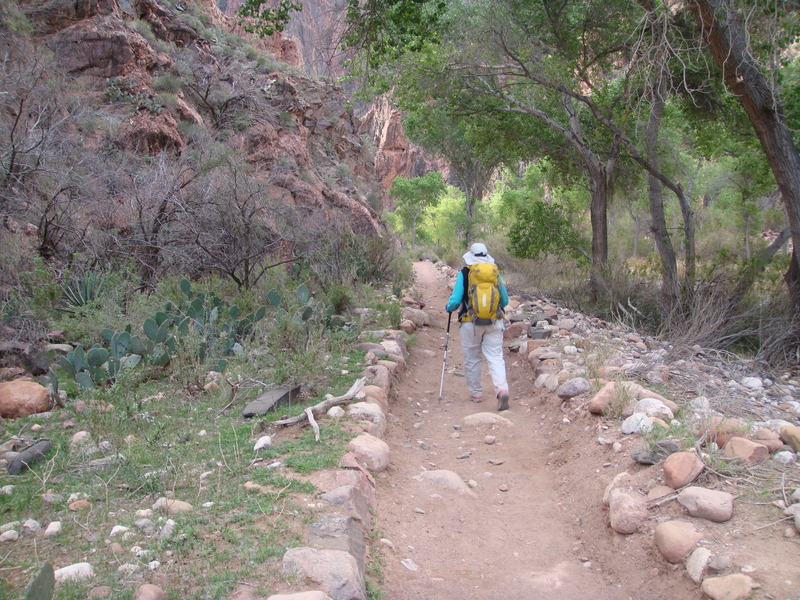 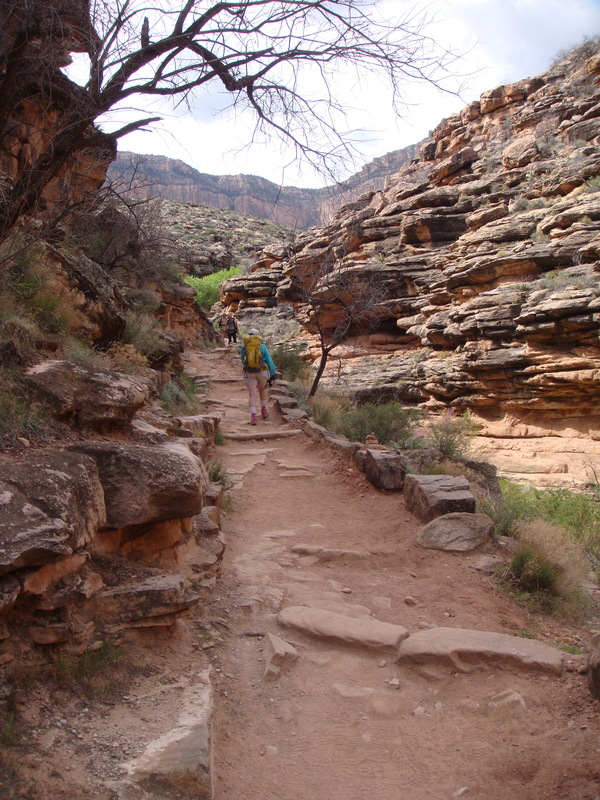 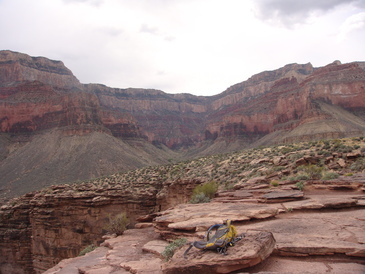 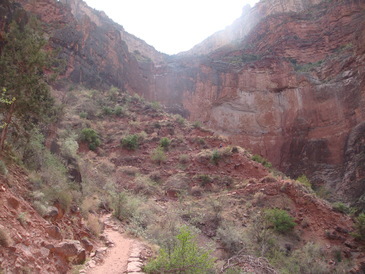 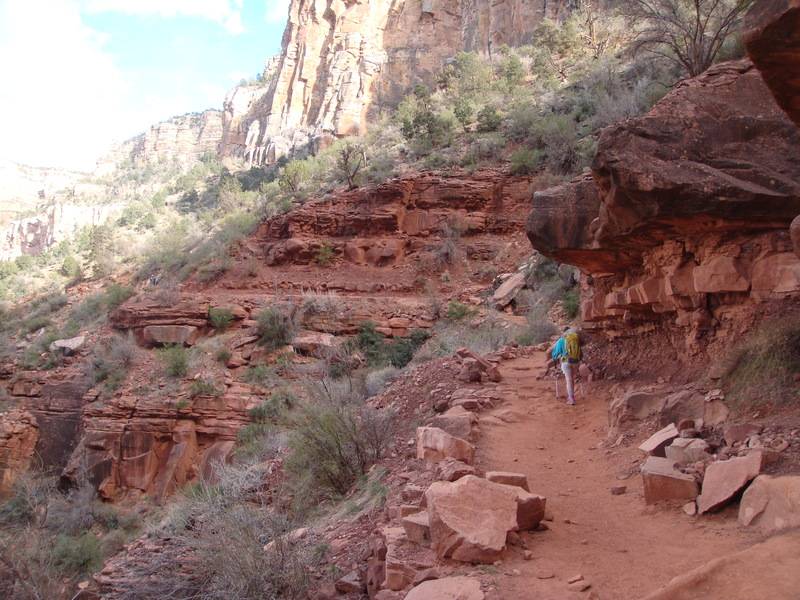 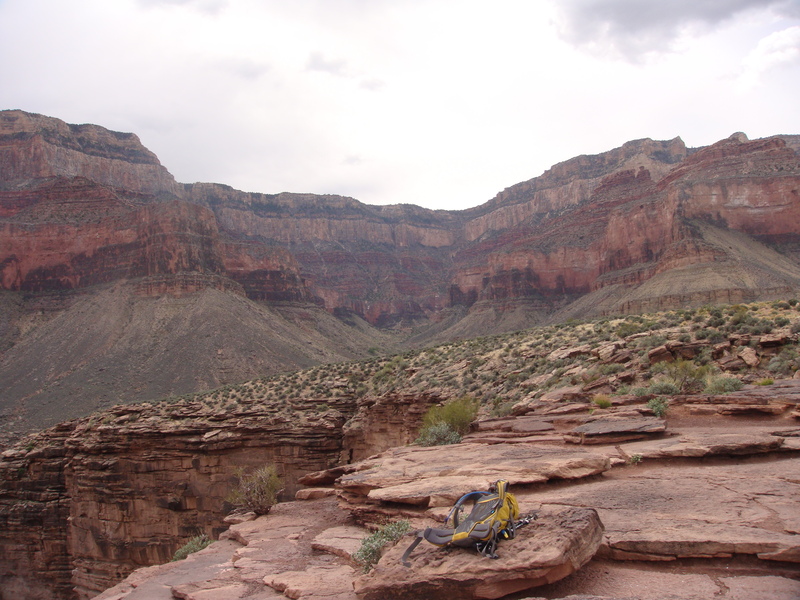 This is vastly different from the South Kaibab Trail, more enclosed and always with some greenery. 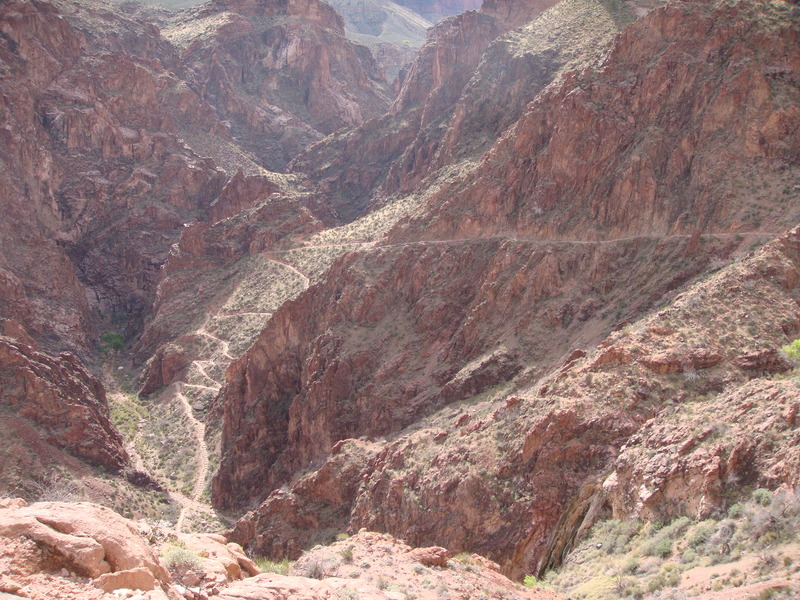 Now we must leave Pipe Creek and climb the Devil's Corkscrew. From the Six-Mile Overlook we get a great view of Devil's Corkscrew and a look ahead to the heights we must yet climb. We join Garden Creek, which feeds into Pipe Creek lower down, so things start getting lush again. 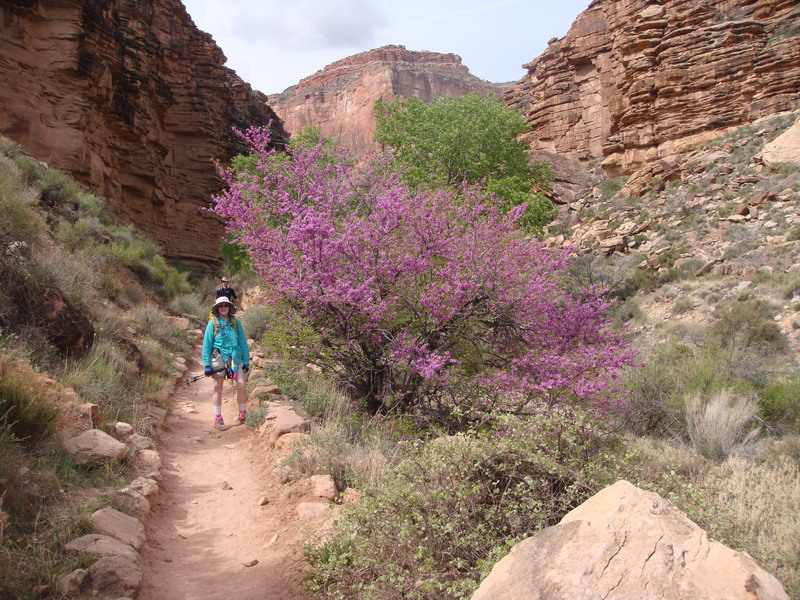 And suddenly a new color appears! This is a redbud tree, just beautiful. 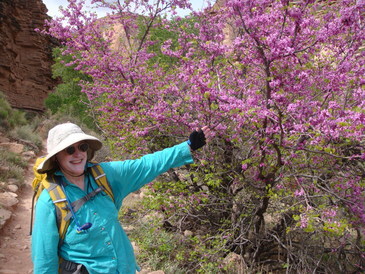 What can I say; we really liked the redbud tree. 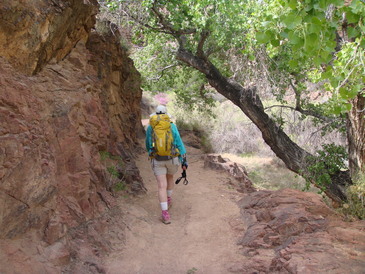 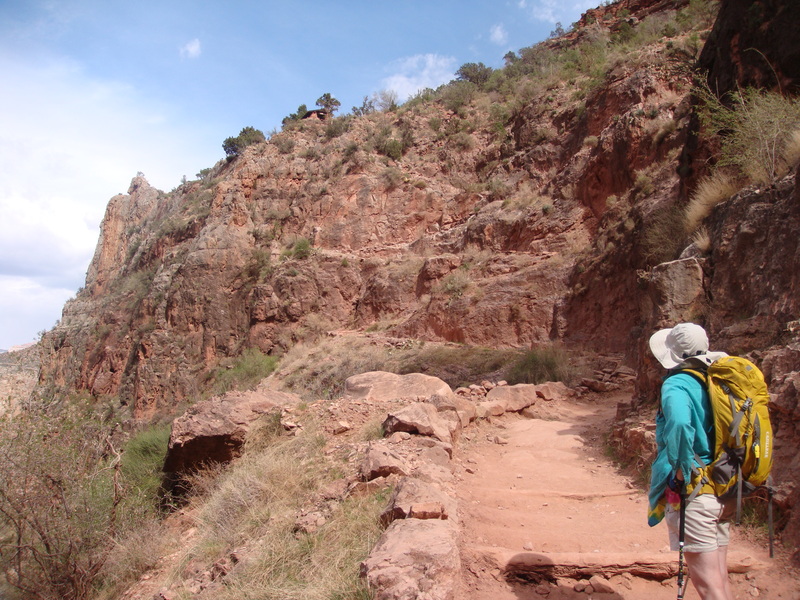 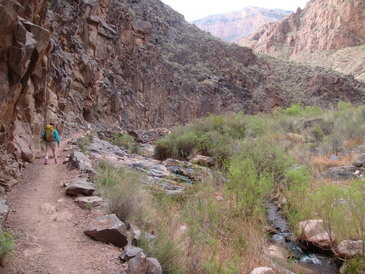 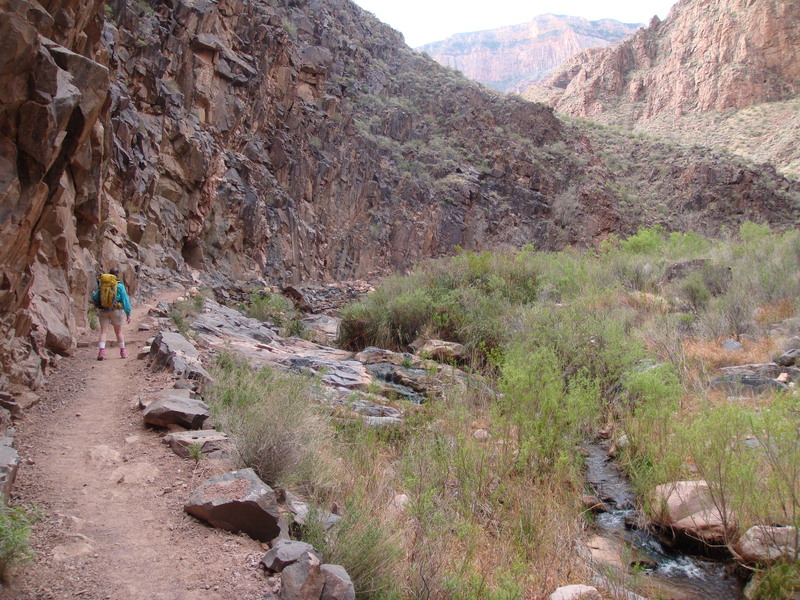 The passage gets narrow again as we climb up through the base rock of the Tonto Plateau. We arrive at Indian Garden Campground. Fresh water, many benches, lots of cottonwood and redbud trees. 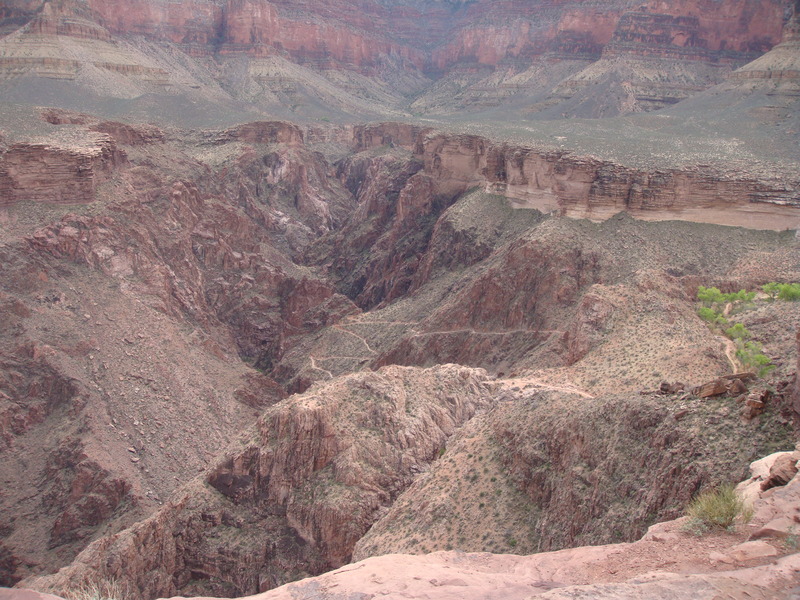 We saw this from the Rim, and it was every bit as nice as it looked. 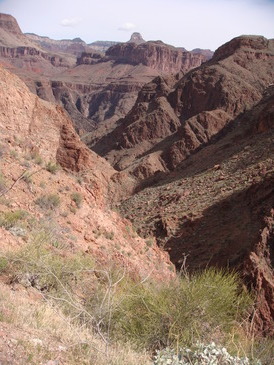 On our side trip to Plateau Point, we can see the narrow canyon we climbed to get up here. 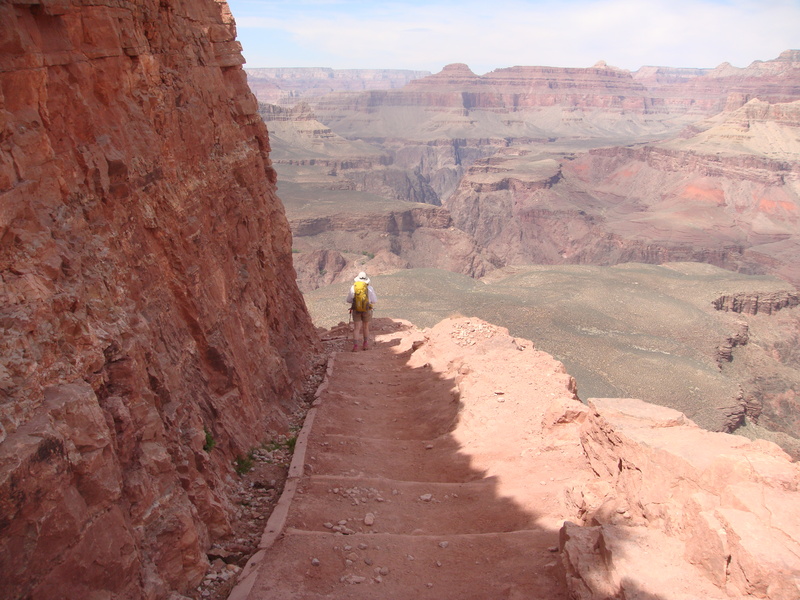 When we got out to the point, we saw a fair number of people with the same idea. The views from Plateau Point were just spectacular. 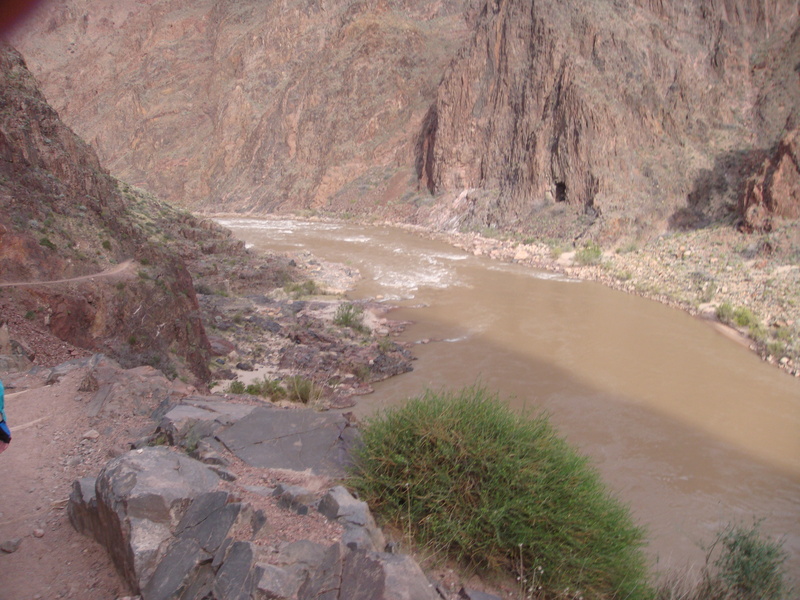 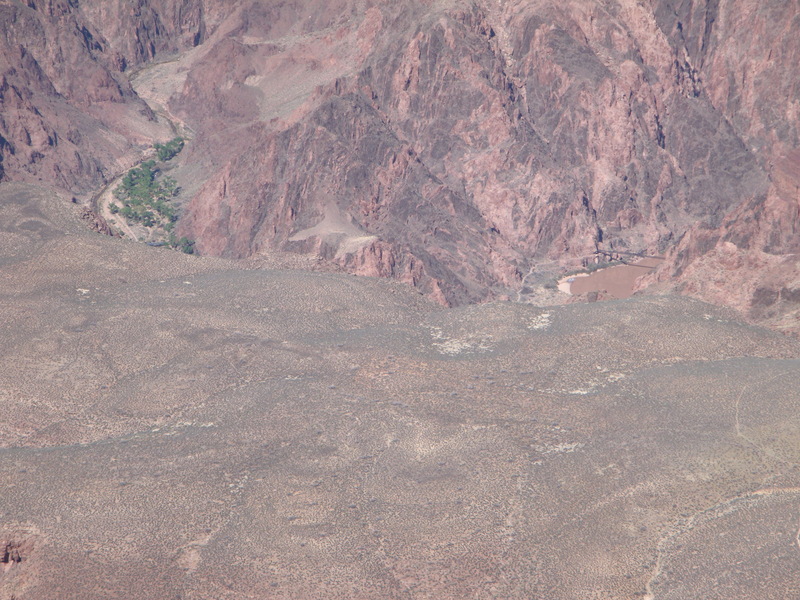 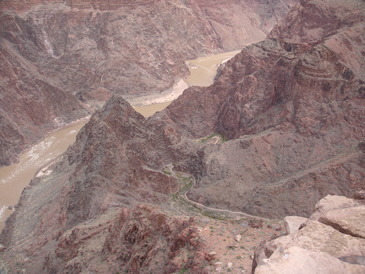 Looking down the Colorado River in a gorge with no room to spare, and looking upstream including the very earliest part of Bright Angel Trail; the River Resthouse is the other side of the pointy peak in the foreground. Another retrospective of Devil's Corkscrew and Indian Garden. It becomes clearer and clearer that at some point we will have to climb those cliffs just under the Rim! In the zoom picture on the right you can see the switchbacks leading up to the cliffs, through the little gap where they change orientation, and even above them up to the Rim. 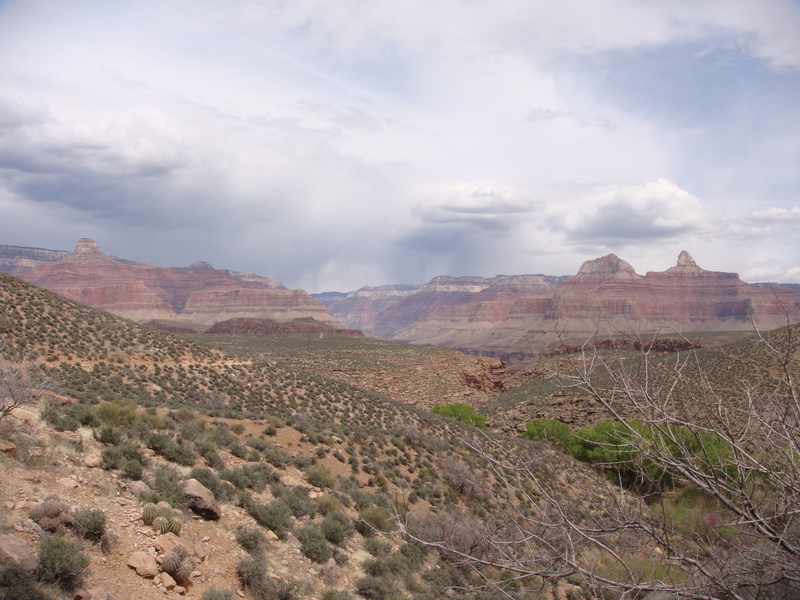 Back at Indian Garden, we can see rain on the North Rim, but never had any ourselves. We had another lunch, topped up our water, and started the really steep part. We come now to another steep stretch called "Jacob's Ladder". 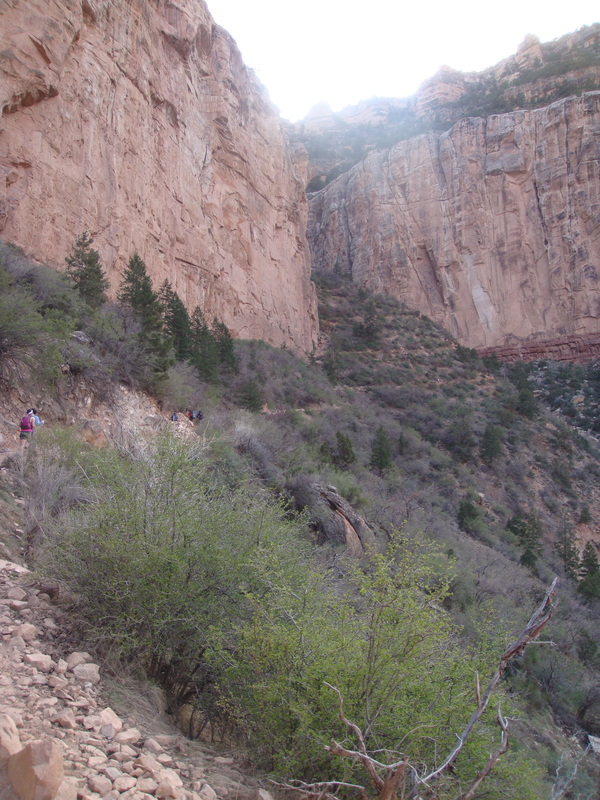 Above the switchbacks you see here, the trail rounds a bend into another whole set of switchbacks, and so on for about 3/4 of a mile. 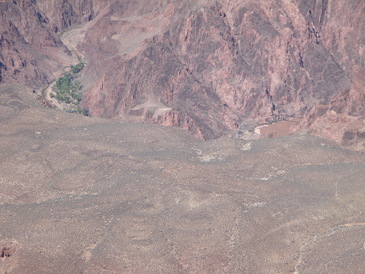 As Lia nears the top of it, you can make out the Three-Mile Resthouse. 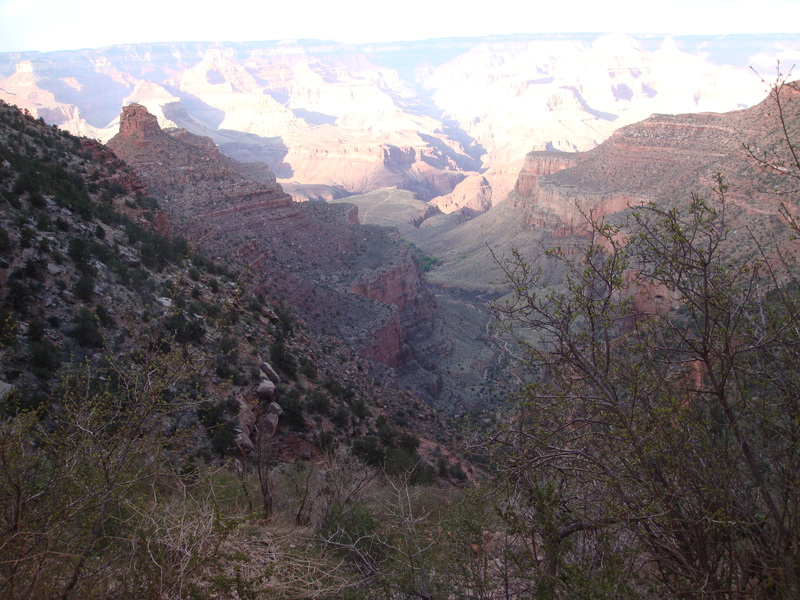 We're still doing well, but afternoon shadows are starting to cover Indian Garden. 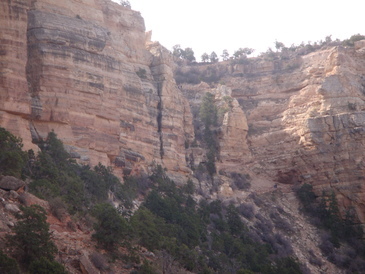 A little farther up we near the base of the white Coconino cliffs. Here you can easily see the narrow cleft between the Coconino cliffs, with the trail winding its way up. As we reach the top, Indian Garden is in twilight and the afternoon shadows are very dramatic. 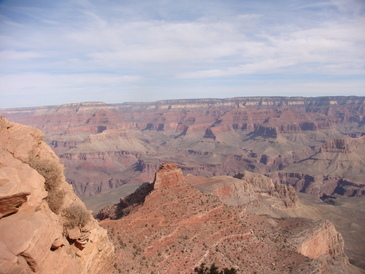 What a fabulous day!